J Varon, O Wenker. The Acute Respiratory Distress Syndrome: Myths and Controversies. The Internet Journal of Emergency and Intensive Care Medicine. 1996 Volume 1 Number 1. The term Adult Respiratory Distress Syndrome (ARDS), was first introduced by Ashbaugh and Petty more than two decades ago. Since then, our understanding of this clinicopathological entity has increased significantly. However, little therapeutic progress has been achieved and the mortality remains high. ARDS is characterized by diffuse pulmonary microvascular injury resulting in increased permeability and, thus, non-cardiogenic pulmonary edema. Ventilation-perfusion lung studies have demonstrated that the predominant pathogenesis of hypoxemia in ARDS is related to intrapulmonary shunts. Common symptoms include dyspnea, tachypnea, dry cough, retrosternal discomfort, and moderate to severe respiratory distress. In most cases the diagnosis of ARDS is that of exclusion. The mainstay of therapy for this syndrome is the management of the underlying disorder causing it. To date, there are no specific pharmacological interventions of proven value for the treatment of ARDS. Once the potentially treatable sources have been found and their therapy started, the main treatment for ARDS is supportive. Ashbaugh and coworkers, in 1967, described a syndrome characterized by refractory hypoxemia, diffuse lung infiltrates on chest radiograph, and decreased lung compliance in a group of 12 patients suffering from severe respiratory failure.1 In addition, these patients had different underlying diseases (e.g. pancreatitis, pneumonia, trauma). Originally, this condition was named by the authors as the Acute Respiratory Distress Syndrome of Adults. However, in 1971 the same authors renamed the syndrome to what we now know as the Adult Respiratory Distress Syndrome or Acute Respiratory Distress Syndrome (ARDS).2 Since then, our understanding of this clinicopathological syndrome has increased significantly. Although the vast majority of patients with ARDS are ultimately managed in intensive care units (ICU), the purpose of this article is to present to emergency physicians, intensivists, surgeons, and other health care providers a review of the pathophysiology, early clinical features, diagnosis, acute management and prognosis as well as some of the common myths and controversies of this devastating syndrome. The signs and symptoms of ARDS may develop either insidiously or over the period of hours or days after the initiating event (e.g.sepsis). On occasion the development of ARDS coincides with the predisposing illness (e.g. gastric content aspiration). Common symptoms include dyspnea, tachypnea, dry cough, retrosternal discomfort, and agitation. The patient appears in moderate to severe respiratory distress and may have cyanosis. Examination of the lungs may reveal coarse crackles and bronchial breath sounds.19 This clinical picture usually deteriorates, and the patient eventually requires assisted mechanical ventilation. Due to the fact that there are no sensitive nor specific markers of pulmonary endothelial/epithelial injury, the diagnosis of ARDS is presently made by physiologic criteria that are themselves controversial.6 As mentioned earlier, the diagnosis of ARDS is that of exclusion. Nevertheless, some laboratory and radiographic tests may be useful. Figure 1. The chest roentgenogram typically shows diffuse bilateral infiltrates. Diffuse pulmonary consolidations with air bronchograms are the result of ARDS following smoke inhalation. 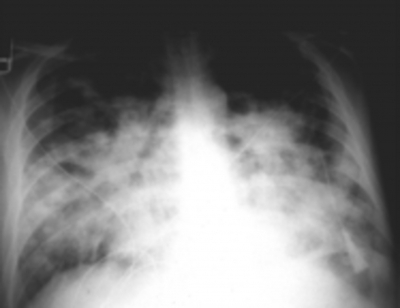 The appearance is radiologically very difficult to distinguish from alveolar edema or diffuse pneumonia. Some radiologists consider that the width of the vascular pedicle is usually larger in cardiogenic pulmonary edema than in ARDS.23 However, in our experience these findings are not sensitive nor specific. The mainstay therapy of ARDS is the management of the underlying disorder causing it, when feasible. Unfortunately, this is not always possible (as is the case of aspiration of gastric contents,smoke inhalation or trauma). Treatable causes of ARDS include sepsis, respiratory infections and shock. (1)Ventilatory support: Assisted mechanical ventilation should be instituted in any patient with ARDS in respiratory failure or impending respiratory failure. We must stress the importance of early assisted ventilation, as prolonged failure to meet the oxygen needs of the tissues will eventually lead to cellular death and organ dysfunction. Once the patient is intubated, the ventilator should be placed on assist-control or intermittent mandatory ventilation, fractional concentration of inspired oxygen (FiO2) of 1 and a tidal volume of 8-12 cc/Kg of ideal body weight. The FiO2 should be reduced as soon as possible. The use of alternate modes of ventilation (i.e. High frequency jet ventilation, inverse ratio ventilation) have not been proven to improve survival. (3) Minimizing the accumulation of pulmonary edema fluid without compromising renal function. In ARDS, direct toxins, free radicals, charged particles and cytokines, all work on specific components of the alveolar capillary cells to result in altered permeability. Clearly, much more work will be needed to unravel the details of the cellular mechanism of normal and altered permeability. This new knowledge will lead to new early diagnostic and therapeutic approaches that may be started in the emergency department, hospital ward or ICU upon patient’s presentation, perhaps leading to a decline in ARDS mortality. 1. Ashbaugh DG, Bigelow DB, Petty TL, Levine BE: Acute respiratory distress in adults. Lancet 1967;2:319-323. 2. Petty TL, Ashbaugh DG: The adult respiratory distress syndrome. Clinical features, factors influencing prognosis and principles of management. Chest 1971;60:233-239. 3. Burke JF, Pontoppidan H, Welch CE: High output respiratory failure: An important cause of death ascribed to peritonitis or ileus. Ann Surg 1963;158:581-595. 4. Taylor RW, Duncan CA: The adult respiratory distress syndrome. Res Medica 1983;1:17-21. 5. Dal Nogare AR: Adult respiratory distress syndrome. Am J Med Sci 1989;298(6):413-430. 6. Murray JF, Matthay MA, Luce JM, Flick MR: An expanded definition of the adult respiratory distress syndrome. Am Rev Respir Dis 1988;138:720-723. 7. Task Force Report on Problems. Research Approaches: Needs. National Heart and Lung Institute. Respiratory Diseases. DHEW. Pub. No. NIH 73-432. 1972: 167-180. 8. Bernard GR, Brigham KL: The adult respiratory distress syndrome. Annu Rev Med 1985;36:195-205. 9. Fowler AA, Hamman RF, Good JT, Benson K, Baird M, Eberly D, Petty T, Hyers T: Adult respiratory distress syndrome. Risk with common predisposition. Ann Intern Med 1983;98:593-597. 10. Pepe PE, Potkin R, Holtman-Reus D, Hudson L, Carico J: Clinical predictors of the adult respiratory distress syndrome. Am J Surg 1982;144:124-128. 11. Petty TL: Indicators of risk, course and prognosis in adult respiratory distress syndrome (ARDS). Am Rev Resp Dis 1985;132:471. 12. Kreuzfelder E, Joka T, Keinecke HO, Obertacke V: Adult respiratory distress syndrome as a specific manifestation of a general permeability defect in trauma patients. Am Rev Resp Dis 1988;137:95-99. 13. Pontoppidian H, Geffin B, Lowenstein E: Acute respiratory failure in the adult. (Three part article) N Engl J Med 1972; 287:690-697, 743-752, 799-806. 14. Hallman M, Spragg R, Harrell J, Moser K, Gluck L: Evidence of lung surfactant abnormality in respiratory failure. J Clin Invest 1982;70:673-683. 15. Petty TL, Silvers W, Paul G, Stanford R: Abnormalities in lung elastic properties and surfactant function in adult respiratory distress syndrome. Chest 1979;75:571-574. 16. Zapol WM, Snider MR: Pulmonary hypertension in severe acute respiratory failure. N Engl J Med 1977;296:474-480. 17. Greene R, Zapol WM, Snider MR, Reid L, Snow R, O'Connell R, Novelline R: Early bedside detection of pulmonary vascular occlusion during acute respiratory failure. Am Rev Respir Dis 1981;124:593-601. 18. Zapol WM, Trelstad RL, Coffey JW, Tsai I, Salvador RA: Pulmonary fibrosis in severe acute respiratory failure. Am Rev Respir Dis 1979;119:547-554. 19. Fraser RG, Pare JAP, Pare PD, Fraser RS, Genereux GP: Diagnosis of Diseases of The Chest. Third edition. Philadelphia: W.B. Saunders Co, 1991:1823-1968. 20. Touissant GP, Burgess JH, Hanipson LG: Central venous pressure and pulmonary wedge pressure in critical surgical illness: A comparison. Arch Surg 1974;109:265-269. 21. Dellinger PR: Complications of mechanical ventilation. In: George RB.(Ed. ):Pulmonary and Critical Care Update. American College of Chest Physicians. 1989;5(10):1-8. 22. Milne ENC, Pistolesi M, Miniati M, Giuntini C: The radiologic distinction of cardiogenic and noncardiogenic edema. Am J Roentgenol 1985;144:879-894. 23. Pistolesi M, Milne ENC, Miniati M, Giuntini C: The vascular pedicle of the heart and the vena azygos. Part II: Acquired heart disease. Radiology 1984;152(1):9-17. 24. Luce JM, Montgomery AB, Marks JD, Turner J, Metz CA, Murray JF: Ineffectiveness of high-dose methylprednisolone in preventing parenchymal lung injury and improving mortality in patients with septic shock. Am Rev Respir Dis 1988;138:62-68. 25. Bernard GR, Luce J, Sprung C, Reinaldo J, Tate R, Sibblad W, Kariman K, Higgins S, Bradley R, Metz C, Harris T, Brigham K: High-dose corticosteroids in patients with the adult respiratory distress syndrome. N Engl J Med 1987;317:1565-1570. 26. Chatterjee K: Congestive heart failure. Advances in treatment. Hemodynamic studies: Their uses and limitations. Am J Cardiol 1989;63:3D-7D. 27. Melot C, Leujeune P, Leemam M, Moraine JJ, Neaije R: Prostaglandin E1 in the adult respiratory distress syndrome. Am Rev Respir Dis 1989;139:106-110. 28. Robin ED: The cult of the Swan-Ganz catheter. Ann Intern Med 1985;103:445-446. 29. Weisman IM, Rinaldo JE, Rogers RM: Positive end-expiratory pressure in adult respiratory failure. N Engl J Med 1982;307:1381-1384. 30. Bone RC, Maunder R, Slotman G, Silverman H: An early test of survival in patients with the adult respiratory distress syndrome: the PaO2/FiO2 ratio and its differential response to conventional therapy. Prostaglandin E1 study Group. Chest 1989;96:849-851. 31. Hopewell PC: Failure of positive end-expiratory pressure to decrease lung water content in alloxan-induced pulmonary edema. Amer Rev Respir Dis 1979;120:813-819. 32. Springer RR, Stevens PM: The influence of PEEP on survival of patients in respiratory failure. Amer J Med 1979;66:196-202. 33. Enhorning G: Surfactant replacement in adult respiratory distress syndrome. Am Rev Resp Dis 1989;140:281-285. 34. Welsh CH, Lien D, Worthon GS, Weil JV: Pentoxifylline decreases endotoxin-induced pulmonary neutrophil sequestration and extravascular protein vascular accumulation in the dog. Am Rev Respir Dis 1988;138:1106-1114. 35. Petty TL, Bone RC, Gee MH, Hudson LD, Hyers TM: Contemporary clinical trials in acute respiratory distress syndrome. Chest 1992;101:550-552. 36. Metz C, Sibbald WJ: Anti-Inflammatory therapy for acute lung injury. A review of animal and clinical studies. Chest 1991;100:1110-1119. 37. Montgomery AB, Stager MA, Carrico CJ, Hudson L: Causes of mortality in patients with the adult respiratory distress syndrome. Am Rev Respir Dis 1985;132:485-489. 38. Elliott CG, Morris A, Cengiz M: Pulmonary function and exercise gas exchange in survivors of adult respiratory distress syndrome. Am Rev Respir Dis 1981;123:492-495. 39. Lakshminarayan S, Stanford R, Petty TL: Prognosis after recovery from adult respiratory distress syndrome. Am Rev Respir Dis 1976;113:7-16. 40. Simpson DL, Goodman M, Spector S, Petty TL: Long-term follow-up and bronchial reactivity testing in survivors of the adult respiratory distress syndrome. Am Rev Respir Dis 1978;117:449-454. 41. Fanconi S, Kraemer R, Weber J, Tschaeppeler H, Pfenninger J: Long-term sequelae in children surviving adult respiratory distress syndrome. J Pediatr 1985;106(2):218-222. 42. Elliott CG, Rasmusson BY, Capro RO, Morris AH, Jensen RL: Prediction of pulmonary function abnormalities after adult respiratory distress syndrome (ARDS). Am Rev Respir Dis 1987;135:634-638. 43. Matthay MM: The adult respiratory distress syndrome: Definition and prognosis. Clin Chest Med 1990;11:575-578. 44. Rinaldo JE: Prognosis of the adult respiratory distress syndrome: Inappropriate pessimism. Chest 1986;90:470-471. 45. Hyers TM, Fowler AA: Adult respiratory distress syndrome: Causes, morbidity and mortality. Fed Proc 1986;45:25-28. 46. Rinaldo JE: Indicators of risk, course and prognosis in adult respiratory distress syndrome. (Letter) Am Rev Respir Dis 1986;133:431. Olivier C Wenker, M.D., D.E.A.A.